Published in Energy Volume 37, Issue 1, January 2012, Pages 27-34. Official version available at Science Direct. Since 2005, (1) world oil supply has not increased, and (2) the world has undergone its most severe economic crisis since the Depression. In this paper, logical arguments and direct evidence are presented suggesting that a reduction in oil supply can be expected to reduce the ability of economies to use debt for leverage. The expected impact of reduced oil supply combined with this reduced leverage is similar to the actual impact of the 2008–2009 recession in OECD countries. If world oil supply should continue to remain generally flat, there appears to be a significant possibility that oil consumption in OECD countries will continue to decline, as emerging markets consume a greater share of the total oil that is available. If this should happen, based on these findings we can expect a continuing financial crisis similar to the 2008–2009 recession including significant debt defaults. The financial crisis may eventually worsen, to resemble a collapse situation as described by Joseph Tainter in The Collapse of Complex Societies (1990) or an adverse decline situation similar to adverse scenarios foreseen by Donella Meadows in Limits to Growth (1972). ► Reduced oil consumption leads to lower economic growth and less capacity for debt. ► Lower capacity for debt leads to debt defaults, reduced credit, falling home prices. ► Oil supply limits appear to be a primary cause of the 2008–09 recession. ► If world oil supply remains level, more recession can be expected in OECD countries. ► Inadequate demand for high-priced oil is likely to cause much oil to be left in place. The future of the world’s oil supply is at this point uncertain. Some observers are concerned about the possibility of peak oil, while others believe that some combination of new technology and improved efficiency will prevent any potential problem. While this latter view is widely held by the public, there is no certainty that such a scenario will come to pass. In this paper, we consider the possibility that world oil supply will not grow significantly above the level that it has maintained since approximately 2005. Furthermore, we consider the possibility that if world oil supply fails to increase, the growth of the emerging economies will create a shortage of oil that will act as a bottleneck for Organization for Economic Cooperation and Development (OECD) economic growth in the next several years. This hypothesis seems reasonable since Smil shows that moving away from a fossil fuel civilization in less than 20 or 30 years is very unlikely, because of the very long time required for transition from one type of fuel infrastructure to another . Biophysical constraints arising from the loss of fossil fuel energy could also be expected to negatively affect the economic process over the long-term . Given our built infrastructure, oil is one input that is currently needed for economic growth. While there are other requirements, such as appropriate social institutions, technology, and ingenuity that are necessary for growth, lack of oil would seem to act as a bottleneck, even if other necessary factors are present. While substantial work has been done outlining the connection of energy supply or oil supply with the economy, little work has been done laying out how, in practice, a reduction in oil supply might affect the credit system and the economic leverage it provides. It is the purpose of this paper to make a first step toward setting forth some of these connections. When this is done, there are striking similarities between the attributes of the 2008-2009 recession and the expected impacts of reduced oil supply on economies. We show that increasing oil supply tends to give rise to economic growth and to conditions that foster the expansion of credit. Economic growth tends to be associated with many other favorable outcomes, including rising home prices, rising stock market prices, and adequate supply of capital. These outcomes play a crucial role in enhancing the positive effects that credit has on the functioning of modern economies. Decreasing oil supply tends to have an opposite effect, leading to economic stagnation or decline and credit restriction, and unfavorable follow-on outcomes, including falling home prices, declining stock market prices, and inadequate supply of capital. Because declining oil supply tends to be associated with credit restrictions and economic stagnation or decline, the common belief that oil prices will rise to a very high level in the face of inadequate supply appears to be untrue. Instead, our research shows that the limiting factor with respect to oil supply is likely to be inadequate demand for high-priced oil. Oil prices are likely to rise to a point where they cause recession and credit contraction, and then decline. After a time, they may rise again with economic recovery, only to fall again when they reach the point when the high prices lead to recession. At times, there may appear to be a glut of oil on the market. Oil prices may never reach a high enough level to stimulate extraction from sources that require very expensive extraction techniques or to encourage widespread use of renewable sources of energy. We show that since 2005, oil consumption of the OECD countries has been declining at the same time that oil consumption of many emerging market countries has been increasing. The effects of reduced oil supply in the period 2005 to 2010 would therefore be expected primarily in OECD countries, and, in fact, this seems to be where recession has been the greatest issue. Energy from oil and energy supplies in total have both been shown to be correlated with economic growth. It is reasonable to expect that if energy growth tends to be correlated with economic growth, oil growth will also, since BP’s Review of World Energy 2010 shows oil to be the single largest component of world fuel supplies . In some studies, there appears to be a causal relationship between energy supplies and growth  . Brown et al examined the causal relationship between energy and economic growth by using “a macroecological approach to integrate perspectives of physics, ecology, and economics with an analysis of extensive global data to show how energy imposes fundamental constraints on economic growth and development” . They found that most metrics of wellbeing, including GDP, literacy, etc., were all positively correlated with, and caused by, energy consumption. Ayres and Warr examined the causal link between energy and economic growth. They showed that high US economic growth rates between 1900 and the mid-70s were based on physical work performed by animals, prime movers, and heat transfer systems . Historical analyses of the link between energy and economic development include analyses by White (1943)  and by Cottrel (1955) . Recent analyses include Slesser (1978) ; Cleveland, Costanza, Hall and Kaufmann (1984) ; Hall, Cleveland and Kaufmann (1986) ; Debeir, Deleage, and Hemery (1991) ; Cleveland, Kaufmann and Stern (2000) ; Ayers, Ayers, and Warr (2003) ; and Smil (2008) . Several studies look at oil use particularly. Murphy and Hall conclude that there is a fundamental limit to economic growth, in that increasing oil supply to support economic growth will require high oil prices, and these high oil prices will in turn undermine that economic growth . Hamilton showed that the oil price run-up in 2007 – 2008 was sufficient to explain the 2008 – 2009 recession of the United States . 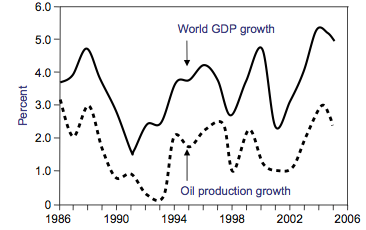 Hirsch showed a graph indicating that increases in world GDP correspond with increases in world oil production during the period 1986 to 2005  (Figure 1). Figure. 1. 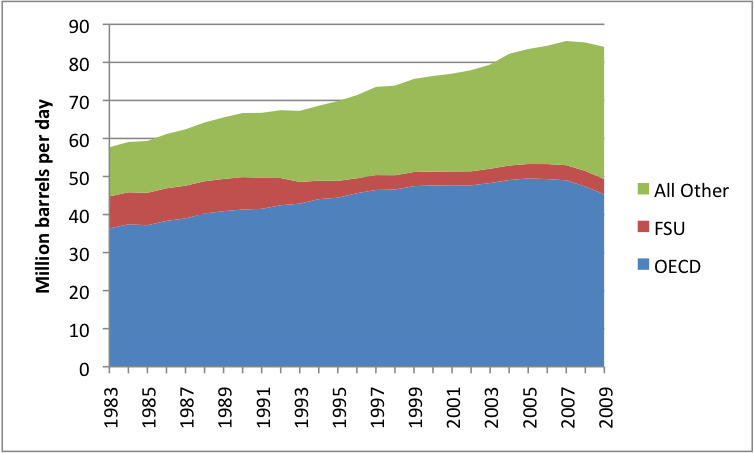 Graph by Robert Hirsch showing the close relationship between oil production increases and world GDP increases in the period between 1986 and 2005 . Rubin, based on a review of the historical record, indicates that in the United States, four out of five recessions between 1970 and 2007 were preceded by oil shocks . Hamilton, based on a review of the historical record, indicates that in the United States, 10 out of 11 recessions since World War II were preceded by oil price shocks . The probability of oil price shocks preceding recession in so many instances would appear to be extremely low, if a causal relationship were not involved. This section looks at the situation of a typical OECD country. That is, it looks at a country that is a significant user of oil products, and is also an oil importer. Countries that export oil will tend to receive offsetting benefits from rising oil prices, so the situation in these countries can be expected to be different. The situation may also be different in countries that use only a small amount of oil in their economies. Since a typical OECD country is an oil importer, its payments to oil exporting countries represent a net outflow of funds. As oil prices rise, the amount of this net outflow of funds increases, assuming the quantity of oil imports remains constant. This rising outflow of funds represents a drag on the economy, since the funds leaving the country represent funds that might otherwise re-circulate within the economy as consumer purchases, wage payments, or capital investment. When oil prices increase, many other prices tend to increase at the same time because oil is used in the transportation of most goods, as a raw material, and in many processes, including planting and harvesting of crops, extracting minerals, and building roads. As a result, when oil prices rise, so do the prices of food and many commonly purchased items. The higher prices for fuels, food, and other products tend to raise inflationary expectations. Central banks can be expected to raise target interest rates, as the US Federal Reserve did in the 2004 to 2006 period, specifically mentioning concern about rising oil prices . Other interest rates can be expected to rise as well, as a result of investors demanding higher interest rates, in reflection of the expectation for higher inflation . Rising prices of oil and food alone would be enough to cause consumers to cut back on discretionary expenditures, since salaries do not rise to compensate for the higher costs. If, in addition to oil and food prices rising, interest rates on loans also rise because of the expected higher inflation rate, a second reason is created for consumers to cut back on discretionary expenditures. Consumers are likely to respond by buying fewer new cars and new homes, going out to restaurants less, and taking fewer vacations. Some may default on their loans. Businesses may find their profitability squeezed as well and lay off workers. The result is likely to be recession with increased default on debts. Housing prices may also decline from lack of demand. These issues are examined more fully in Section 5. It should also be noted that when oil prices rise, the impact on the cost of production of goods and services is greatest in countries that use the most oil, which, in most cases would be OECD countries. Countries that use oil to a much more limited extent can be expected to experience a lesser rise in the cost of production. This higher inflation in the cost of production in OECD countries would be expected to give a greater competitive advantage to countries that use less oil. To the extent that more production of goods and services is transferred to Emerging Markets as a result of this rising cost difference, oil consumption can be expected to fall in OECD countries and rise in Emerging Markets. This increase in consumption in the Emerging Markets can be expected to come in two ways: (1) from the oil used in the production and transport of the additional goods produced and (2) from additional wages paid in the Emerging Market country, enabling additional consumption of products made using oil. The OECD country will find a correspondingly reduced demand, resulting both from reduced production of goods, and from the decline in wages paid to OECD workers, limiting their ability to buy goods produced using oil products. Many people assume that oil supply issues did not start until 2007 or 2008, when oil prices started appearing on the front pages of newspapers, and therefore it could not be associated with housing issues, which began earlier. We show in this section that world oil supply constriction started about 2004 based on price trends, and that the restriction affected primarily OECD countries. 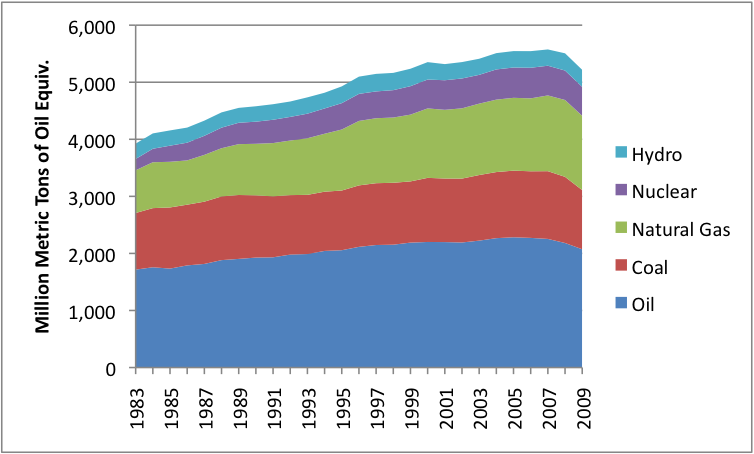 World oil production has been level since roughly 2005, as illustrated in Figure 2. This happened, even though oil prices have been rising since 2004 in a pattern that would suggest greater supplies were desired. Oil prices began rising in 2004 and reached a peak in 2008. Even when prices dropped in late 2008, they never reached the low prices that predominated prior to 2003. Starting in late 2010, prices began rising, and at this writing are again near $100 barrel. If supplies are not constrained, it is difficult to understand such a significant price rise. World oil consumption has been roughly flat since 2005. Consumption patterns vary greatly by region of the world. OECD oil consumption reached a maximum in 2005. Since then, it has decreased so that in 2009, OECD oil consumption is at approximately the same level as in 1996. 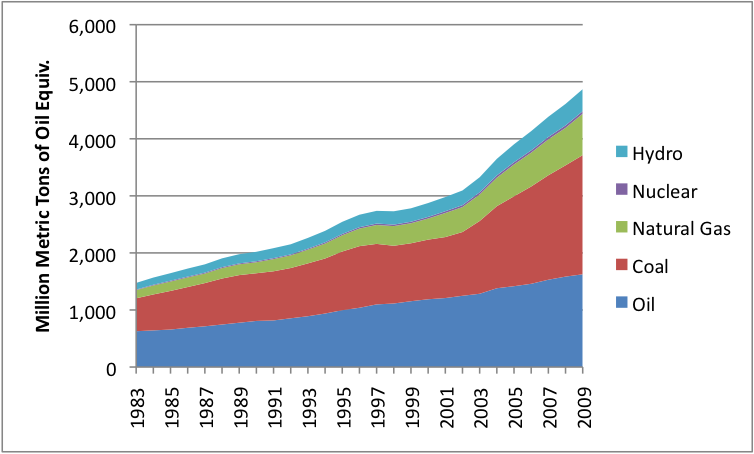 Oil consumption of the Former Soviet Union (FSU) hit a high in 1987. It decreased until the year 2000, and then began rising again. The “All Other” category includes China, India, the oil exporters, and other emerging markets. Their oil consumption has continued to increase, reaching a record level in 2009. This comparison shows that in the competition for world oil supplies, the “All Other” countries are outbidding the OECD, where consumption has been declining since 2005. On a per-capita basis, the decline in OECD consumption would be greater, since population has been growing. In this section, we examine trends in total energy consumption for the groupings, to see how these differ from oil supply trends. We find that energy consumption for OECD was essentially flat in the 2005 to 2007 period, and declined in 2008 and 2009. Figure 4. Energy consumption the OECD countries showed low growth in the 2005-2007 period, and declined in 2008 and 2009. This relatively flat growth rate, followed by decline, is in contrast to the 1983 to 2004 period, when OECD total energy consumption increased by an average of 1.6% per year. 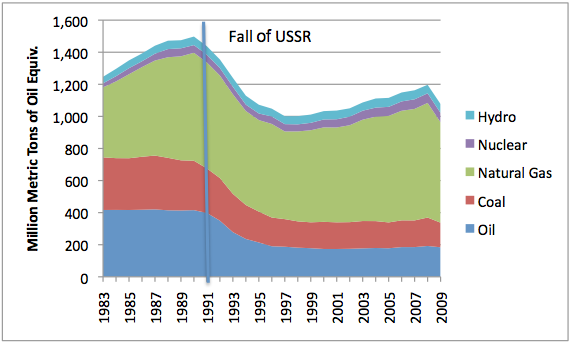 Total energy consumption for FSU started dropping in 1991, at the time of the collapse of the USSR, and began rising again in 2000. Total energy consumption for the “All Other” category of countries (Figure 6) has been rising even more rapidly than its oil consumption, and very much faster than OECD total energy consumption. Based on these patterns and the relationships indicated between GDP and energy /oil supply, a person would expect GDP of the “All Other” countries to be increasing rapidly. GDP growth would be expected to be lower for OECD. It is not clear from the graphs whether OECD’s economic growth would simply be lower than that of the All Other countries or if it would be negative, because of the imprecision of measurement (for example, how to combine different fuel types) and because in theory, a gain in efficiency may permit a small GDP gain, even with a small decline in total fuel use. The fact that OECD’s oil consumption has been declining since 2005 is an important variable in itself, because oil accounts for a high percentage of energy used in transportation (95% in the United States ) and is used in equipment used for planting and harvesting of crops. Hirsch in a 2005 report for the US Department of Defense showed that effective mitigation of oil supply decline through production of alternative fuels and replacement of existing vehicles can be expected to take 20 years . Bio-fuels, solar and wind energy should theoretically be added to the fossil fuel amounts shown in Figures 4, 5, and 6, to the extent that they add energy over and above the fossil fuels that are used in creating them. Ethanol is the largest of these. It was shown (on a gross energy basis) in the BP data set, but the amount contributed on a gross energy basis was too small to be visible on the graphs. For OECD, ethanol amounted to only about 10% of the hydro amount in the year with the largest contribution. Its contribution would be significantly smaller on a net basis. The net energy contribution of the wind and solar in a given year would be the energy production of wind turbines and solar panels (regardless of the year of manufacture) less the fossil fuel and other energy costs associated with the creation of new wind turbines and solar panels in the current year. In times of rapid growth, the net energy contribution of wind and solar would be expected to be quite low, and might be negative . The omission of wind and solar growth would not appear to be material in the comparison of total energy growth for the three country groupings shown in Figures 4, 5, and 6. Many people believe that the only alternative to adequate oil supply is for the amount of oil produced by oil companies to fall and because of this, for shortages to result. While this scenario is possible, especially in the presence of price controls, in this section we show how demand limits may also limit consumption. In this section we will show that oil prices don’t rise without limit. The constraining factor holding production down is often inadequate demand for high-priced oil, rather than inadequate supply of such oil. The result is what appears to be a “glut” of high-priced oil on the market. If oil were inexpensive, there would be plenty of demand for oil. Whether or not oil prices can continue to rise indefinitely is important, because if oil prices can rise indefinitely, then there would seem to be a substantial chance that the entire amount of oil resources that have been identified can actually be extracted and used. But if oil prices can only rise to a price of $x before recession sets in, then the majority of oil resources which cannot be economically produced for a price of $x or less will be left in the ground unless at some point in the future, conditions change materially. If a seller tries to charge more than $x, the situation will appear as though demand is not high enough for the resources, and indeed, it is not high enough for oil over a price of $x. There may be an over-supply of high priced oil. But if inexpensive oil were available, it would be used in ways that might help generate economic growth. There may still be some market for expensive oil (for example, as a feedstock for making pharmaceuticals), but this will not by itself be sufficient to keep demand elevated for high-cost oil. There are at least two ways of seeing that oil prices cannot be expected to rise indefinitely. In fact, it is possible that for OECD countries, we are already approaching the upper limit for oil prices. First approach—when does recession hit? In Section 2.2, it was shown that high oil prices tend to give rise to recession. Lower demand during recession tends to cause the price of oil to decrease. Eventually, though, demand starts rising, especially in the parts of the world that are not subject to recession. If oil supply is not adequate, this higher demand tends to raise prices. But if prices rise sufficiently, recession sets in, and prices fall again. This pattern can be expected to give rise to price oscillation, rather than very high prices. Balogh has shown that US oil prices appear to cause recession when they are above $85 a barrel in 2008 dollars . Second approach—how much does it cost to produce the oil? When oil is extracted, it takes oil and other scarce goods to extract that oil. Furthermore, it is not just the oil directly used in the project that is used. It is also the “overhead” that society needs to have funded to maintain the extraction activity—the roads, the schools that educate those who learn to do the extraction, the water and sewer system, the health system, and many other services. In countries where workers live in unheated huts and roads are dirt roads, the overhead component would be low, but in countries that use well-constructed, heated homes, paved roads, and extensive educational and health systems, the overhead will be high . At some point, the cost of extracting the oil becomes too high, relative to the value received from the oil. The cut off point where the cost of extraction exceeds the value received from the oil can be expected to vary around the world, with countries that provide the most extensive services (roads, education, health) having the lowest price at which extraction ceases to be economic, and countries with the least extensive services having the highest cost at which extraction exceeds the benefit from the oil. With this reasoning, it is possible that the “All Other” group of countries illustrated in Figure 6 are not yet near their economic cut-off, even though OECD countries may be. If the more advanced countries drop to a lower standard of living, perhaps at some point in the future, they will be able to afford somewhat higher priced oil, but there will still be a limit. It is only if technology advances occur that permit oil to be extracted at lower cost that resources that appear to be locked out by the price limit can be extracted. Campbell described a similar phenomenon. Peak oil will bring about short bouts of economic growth and contraction as oil demand and prices play tug-of-war, creating what has been referred to as an undulating plateau . A growing economy can be visualized as a series of circles, getting larger each year as the economy expands. In such a model, each person’s share (based on wages, pensions, profits, etc.) can be viewed as a wedge. As long as the economy is growing and the circles are getting larger, each person has a reasonable chance of getting a greater quantity of goods and services over time, because the total supply is getting larger.1 As long as economic growth is the norm, an actuary putting together a pension plan can be expected to reflect the expectation of continued growth in the parameters of the plan, and governments can be expected to promise pensions based on the assumption of continued growth. Stock market valuations of companies are also likely to be based on the assumption of continued economic growth. In this model, if suddenly the circles start getting smaller, the situation changes greatly, because now the future becomes worse than the present—in total, if not for each individual. The total quantity of goods and services each year starts declining, instead of increasing. Promises must be kept much smaller, if they are to be fulfilled. And the possibility of borrowing to cover a current expense and paying for it in the future becomes more remote. Economic growth is an enabler of our system of widespread use of leverage. The higher the economic growth rate is, and the lower the real interest rate is in relationship to the economic growth rate, the easier debt is to repay. In this section, we show that as the economic growth rate declines, the number of debt defaults can be expected to rise, and the number of loans that make sense from a business perspective can be expected to decrease. If the economic growth rate actually becomes negative, the impact can be expected to be especially severe. If a person borrows $1 today, he will need to repay (1 + i)n at the end of n years, if the interest rate is i. If the real growth rate is g between the time the loan is taken out and the time the debt needs to be repaid, and if his income rises as fast as the real growth rate, then the repayment of the debt seems (in terms of the economic impact to the borrower) to be equal to (1 + i)n / (1 + g)n. Clearly, the higher g is, and the lower i is, the more favorable the terms are to the borrower. If i = g, then growth offsets the interest added. We omit inflation in this discussion, because clearly lenders will want to receive in return at least as many goods and services as they initially lend, plus a suitable risk free interest rate, and plus a suitable insurance charge to cover the risk of default. The principles developed here will therefore apply in the case where there is inflation. It is possible that on a temporary basis, inflation may make the relationship turn out differently, but if lenders are rational, they will adjust interest rates to reflect inflation expectations, in addition to other funding needs. In the real world, there is a huge number of different borrowers, with a variety of uses for the funds they are investing, and with different circumstances when the time comes to pay back the loans. 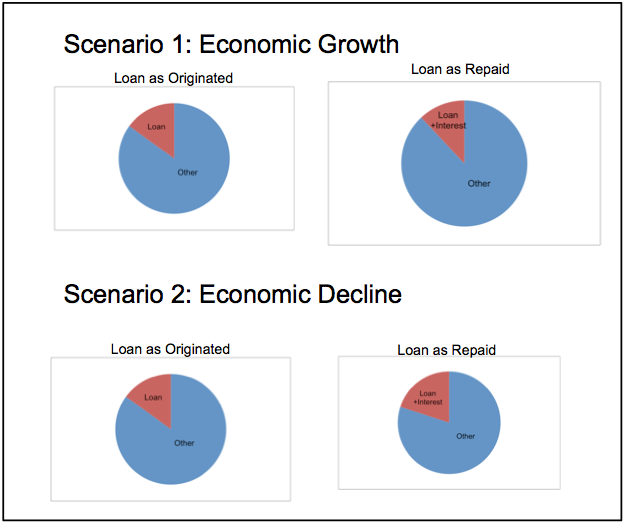 If the economic growth rate declines, and lenders continue to make the same loans as in the past, a person would expect the default rate to rise, because within the mix of all of the loans given, and the mix of circumstances for repayment, there would be more and more borrowers finding that their circumstances were not as favorable as they had hoped—-they had been laid off from work, or their wages had been frozen, or the restaurant they bought with borrowed funds has fewer customers than they had planned for. Theoretically, lenders could still make the same loans as previously with the lower economic growth rate, if they increase the insurance charge in their loans to take into account the higher possibility of debt default. But if they do that, the gross interest charges on loans would need to rise for all but the most credit-worthy purchasers. With the higher interest charge, and the continued lower growth rate, other borrowers, too, would find it increasingly difficult to pay back debt with interest. In theory, a new equilibrium point would eventually be reached, but it most likely would not include the borrowers who were least credit-worthy (for example, those laid off from work), and the interest charge for debt defaults on the remaining loans would be higher. To fully model this, one needs a multi-dimensional model, representing all borrowers and all of their circumstances of repayment. In a time of rapid economic growth, relatively more of the borrowers would be expected to repay their debt with interest. In a period of slower economic growth, relatively fewer would be expected to repay their debt with interest. Those who are unable to repay would disproportionately be those who would be considered least credit-worthy in the first place. With respect to US home loans, these would likely be the subprime mortgage holders. If economic growth rates should actually drop below zero, the problem with repaying debt with interest can be expected to be even greater. In this case, the total amount of goods and services available in each future year would decrease, but lenders would still expect all borrowers to repay the full amount borrowed, plus interest. Paying the full amount back with interest, when total income is dropping, would make it difficult for the debtor to meet all of his other obligations. Figure 7. In a period of economic decline (Scenario 2), the amount a debtor has left over after repaying debt plus interest is disproportionately large, leaving the debtor with inadequate funds for paying other expenses. In a period of economic growth (Scenario 1), the overall growth in incomes tends to compensate for the need to pay back the debt with interest. Even if there is long-term economic decline, a few loans could still be made profitably, relating to investments with high expected rates of return. Most loans, however, would have such high expected default rates that the gross interest rate (inclusive of the insurance charge for default) would make the loans unreasonably expensive for the majority of borrowers. A growing economy generates positive feedback loops. If the cause of the growth is additional energy supplies, these feedback loops will relate to the additional goods and services that can be created using these rising energy supplies. Demand for these and other goods and services is enabled by the wages that are paid to the workers involved in producing the additional goods and services. Tverberg showed that in the United States, the number of available jobs is closely correlated with oil consumption . -Property values rise since there is additional demand for homes and business properties. -Layoffs are relatively rare because of high demand for goods and services. -Business margins are good, because sales volumes are high relative to fixed costs, and because high demand elevates prices for goods and services. -Government revenues increase, since tax revenue reflects the prosperity of individual citizens and of businesses. -It is relatively easy to implement efficiency improvements, because revenues provide funds to pay for new laborsaving machines and more energy efficient vehicles. -Investment in new businesses and expansion of existing business is easy, in part because it is easy to borrow money for investment because repayment rates are high. Furthermore, cash flow for new investment is expected to be good, because high demand keeps prices elevated, and because high volume of sales keeps fixed costs low relative to expenses. -The stock market tends to rise, because demand is high and long-term prospects appear good. As a result, it appears easy to fund retirement plans, and employers may be generous in offering such plans. All of these characteristics of a growing economy are likely to help continue the trend toward growth. If real growth is not as high as desired, increased debt can be used by governments to give the appearance of growth, since it can temporarily boost demand, and thus provide much of the same effect as growth based on rising wages related to the production of more goods and services. But if oil supply continues to be depressed, our analysis indicates that credit cutbacks are likely. These credit cutbacks can be expected to lead to situations where the debt used to create artificial growth needs to be paid back with interest, without the availability of additional debt to replace the expiring debt. In a declining economy, the feedback loops described in Section 5.3.1 can be expected to work in the opposite direction, because instead of rising wages increasing demand, the situation becomes a situation of lower total wages decreasing demand (because with less energy, fewer goods and services can be produced, so less wages are paid in total). With less demand, property values tend to fall, and layoffs become more common. For reasons described in Section 5.2, lenders become much less willing to lend money for new investments. Furthermore, with depressed prices because of low demand, there may be little money from cash flow for new investments, so new investment may become difficult. The amount of money consumers are able to spend is likely to fall below what their salaries would suggest, because of reduced debt availability, declining stock market prices, and lower home prices. All of these downward forces tend to accelerate the economic decline, if one has been started by an external force. Thus, once economic decline has started, it may be difficult to stop. Investment in new plant and equipment may be a particular problem if a business owner is required to pay off old debt and cannot arrange new debt. The amount of US consumer credit outstanding reached a peak exactly the same month that world oil prices hit a peak, that is, July 2008. 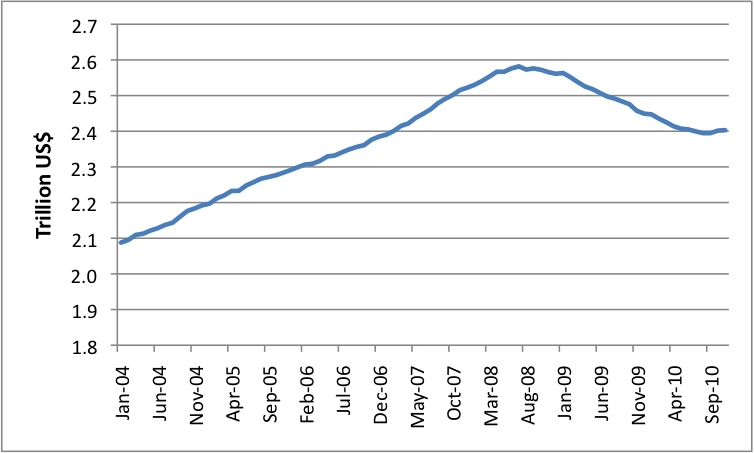 After that, consumer credit outstanding declined month after month, until September 2010. 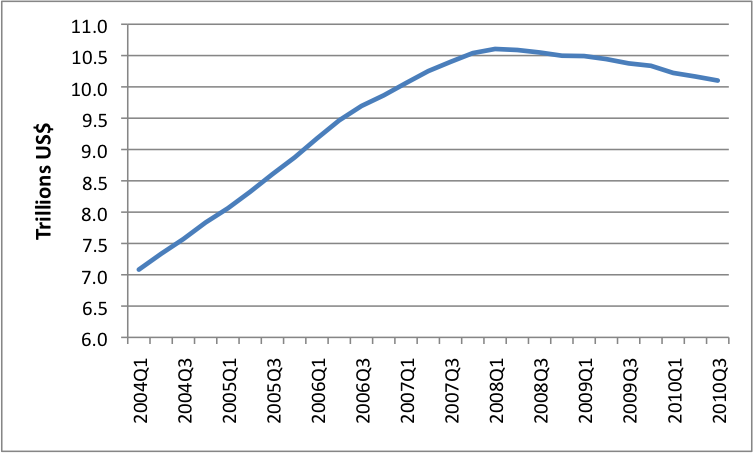 The amount of home mortgages loans outstanding hit a peak in early 2008, and has been declining every quarter since then. 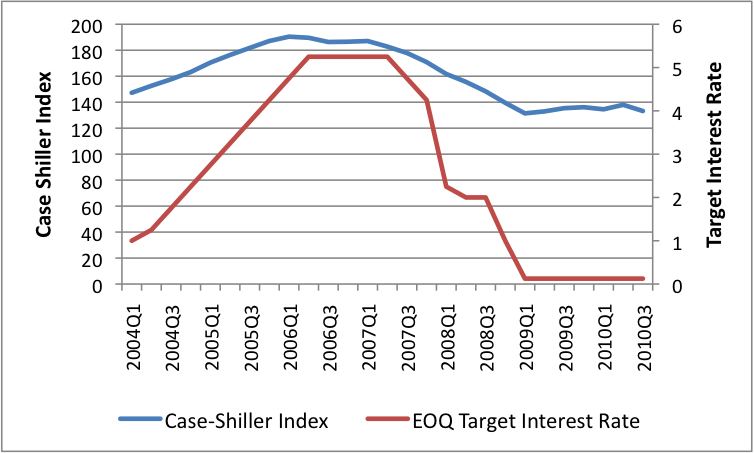 The Case-Shiller home price index turned down in early 2006 (Figure 10). This came at a time when oil prices were rising (see Figure 2), and these higher oil prices affected the available income of home-buyers, especially in the outer suburbs, where the problem was noticed first. The US Federal Reserve, in its minutes, specifically referenced rising oil and food prices as reasons for raising target interest rates (Ludlum) . When oil prices rose and interest rates also rose, a reduction in housing demand occurred, which helped prick the sub-prime mortgage bubble. 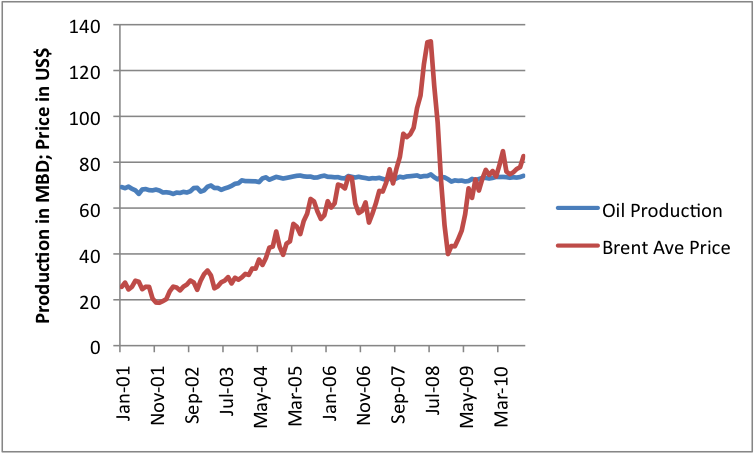 Note that the big change in mortgages outstanding did not come until 2008. Scenario 1. There is an increase in world oil supply and OECD gets a large enough share of the increase so that its oil supply again starts increasing on a consistent basis. If this should happen, OECD might again see significant economic growth. If the rate of increase in consumption is very low, there might still be some economic problems associated with debt-defaults, restricted credit availability, and a tendency toward economic stagnation. Scenario 2. There is an increase in world oil supply, but OECD countries are unable to compete for it, or refuse the oil that is available, or tax the oil to the point where consumption continues to fall, in the interest of limiting CO2. The likely outcome for OECD would seem to be economic decline and debt defaults because of the reduced oil supply. If the cutback in fuel use is voluntary, will this affect the outcome? There is no clear reason why it should. The real question would seem to be whether businesses (a) can continue to produce the same amount or more of goods and services, and (b) can hire enough workers at wages that are high enough to keep demand up, even with the reduced fuel supply. Section 2.2 showed that if oil prices rise, the usual outcome in OECD countries is for demand for other goods to decline, and layoffs to occur. One way of avoiding this outcome is through government-subsidized oil prices, but this is usually only feasible for oil exporting nations. Alternatively, adverse outcomes can be avoided if oil use has been reduced to the point where it plays only a very minor role in the economy, but this needs to be accomplished in advance. A third option would be to not permit companies to make layoffs, even if demand for the company’s goods and services declines. This approach again would require large subsidies. Scenario 3. There is a possibility that world oil production will remain flat, or decline. In this scenario, indications are that the “All Other” countries will continue to outbid “OECD” for oil supplies, and OECD’s oil use will continue to decline. Recession and debt defaults are likely outcomes. Lower credit availability and lower demand can be expected to reduce demand for natural gas, coal, and alternative fuels, as it did during the 2008-2009 recession, making the impacts greater than the oil shortage by itself might suggest. This reduction in demand is expected to reflect a shortfall of demand for high-priced energy products (analogous to the lack of demand for high priced oil). Unless low-priced energy substitutes can be found, it is not clear that there is a cure for this lack of demand. While we cannot know what the future will bring, the evidence would seem to suggest that we are reaching limits on the amount of oil that the world can extract at a price OECD countries can afford to pay without causing serious recession. While there is a theoretical possibility that some way can be found around this roadblock, perhaps through innovation that brings down the price of oil extraction, or through the development of inexpensive alternative fuels, there appears to be a real possibility that OECD’s oil consumption will continue to fall, and OECD countries will continue to experience recession and debt contraction. One concern is that this could end very badly. Banks, insurance companies, and pension plans are all operated with the expectation that most debt will be repaid according to schedule, with appropriate interest added. They will encounter serious financial difficulties if they encounter a substantial number of defaults because their equity will be quickly eroded. The government can use bailouts and stimulus funds to temporarily remedy the situation, but eventually the widespread nature of the problem will become evident. There are various types of insurance programs that have been set up to handle bankruptcies of financial institutions  , but they have not been set up to handle a situation where problems are widespread. The assumption that is always made in funding these programs is that bankruptcy is a very rare independent event. At some point, there would appear to be a possibility that the financial system and the international trade system would be at risk of disruption, because these both depend on debtors being able to fulfill the terms of their loans. Also, if economic decline starts, there seems to be evidence that it is self-reinforcing if OECD countries must compete with oil exporters and emerging economies for a virtually flat supply of oil, as in the recent past. Investment capital is likely to be in very short supply, because debt for investment will not be very available, and businesses may still need to pay back past loans in a declining economy. Lower energetic supplies will make it difficult to maintain all aspects of infrastructure. Both Tainter  and Meadows  have described adverse scenarios, where all systems seemed to deteriorate at the same time. While there is no certainty that we are approaching such an outcome, it would seem to be an outcome that we should be considering. Some are hopeful that a steady state economy can be developed that can prevent collapse and allow world population to live at a lower, but acceptable, level , . Research is needed as to the feasibility of this alternative. How many people can the world support with minimal use of fossil fuels? What type of lifestyle can be expected for these people? Without research in this area, there is a possibility that advocates of a steady state economy are proposing an alternative that does not differ materially from a collapse scenario. I want to thank Mario Giampietro, Nate Hagens, David Murphy, Joseph Tainter, and actuary Oliver Bettis for feedback on drafts of this paper. I also want to thank Charles Hall for his encouragement and support in investigating this topic. Smil V. Energy Transitions: History, Requirements, Prospects. Santa Barbara (CA): Praeger; 2010. Georgescu-Rogen N. The Entropy Law and the Economic Process. Cambridge (MA): Harvard University Press; 1971. Stern DI. Energy use and economic growth in the USA; a multivariate approach. Ener. Econ. 1993; 15: 137-50. Brown JH, Burnside WR, Davidson AD, DeLong JP, Dunn WC, Hamilton MJ, et al. Energetic Limits to Economic Growth. Bioscience. 2011 Jan;61(1):19-26. White LA. Energy and evolution of culture. American Anthropologist 1943; 14: 335-56. Cottrel WF. Energy and society; the relation between energy, social changes, and economic development. New York: McGraw-Hill; 1955. Slesser M. Energy in the Economy. London: MacMillan; 1978. Cleveland CJ, Costanza R, Hall CAS, Kaufmann R. Energy and the U.S. Economy: A Biophysical Perspective. Science 1984; 225:890-7. Hall CAS, Cleveland CJ, Kaufmann R. Energy and Resource Quality: the Ecology of the Economic Process. New York: Wiley-Interscience; 1986. Debeir JC, Deleage JP, Hemery D. In the Servitude of Power: Energy and Civilization through the Ages. Atlantic Highlands (NJ): Zed Books Ltd; 1991. Cleveland CJ, Kaufmann R, Stern SI. Aggregation and the role of energy in the economy. Ecological Economics 2000; 32:301–17. Ayres RU, Ayres LW, Warr B. Exergy, power and work in the US economy, 1900-1998. Energy 2003; 28 (3): 219-73. Smil V. Energy in Nature and Society: General Energetics of Complex Systems. Cambridge (MA): The MIT Press; 2008. Murphy DJ and Hall CA. Energy return on investment, peak oil, and the end of economic growth. [In Press] Annals of the New York Academy of Sciences. Issue: Ecological Economics Reviews. 21 pages. Hirsch RL. Mitigation of maximum world oil production: Shortage scenarios. Energy Policy 2008; 36: 881-9. Rubin J. Why Your World Is About to Get a Whole Lot Smaller: Oil and the End of Globalization. Mississauga, Ontario: Random House; 2009. Colin C. Why dawn may be breaking for the second half of the oil age. First Break. 2009; 27:53-62. Reinhart CM and Rogoff KS. This Time is Different: A Panoramic View of Eight Centuries of Financial Crises. (March 2008) NBER Working Paper No. 13882. 123 pp; quote from p 15. Collis, H. 101 American English Proverbs. Chicago (IL): Passport Books; 1992. Tainter JA. Collapse of Complex Societies. Cambridge (MA): Cambridge University Press; 1990. Meadows DH. Limits to Growth. New York: Signet; 1972. Daly HE. Toward a Steady-state Economy. New York: WH Freeman & Co., Ltd; 1973.